This book is more than just a collection of colour illustrations, measurements and descriptions bound together. It will be used for generations to come as a guide to the collector; a documentation chronicling individual toys and an inspiration to new collectors. Although toys of various types have existed throughout history, it’s only since the industrial revolution that mechanical toys have come into their own. These toys have had two lives; first their primary use as a plaything to entertain or educate a child. If preserved, they have then moved into their second phase and have been handled down to be admired by the next generation. Owing to the rapid pace of evolution since the turn of the twentieth century, each represents a unique insight into the design and function of the machine, or the characters that the toy replicates. In most cases, this has been a form of transport, boats, aeroplanes, trains or automobiles, and automatons which often mimicked contemporary life. Because many toys have been regarded in the past as disposable, their rarity has increased. It was as early as the 1930’s that serious collections were started. Since then, collectors from all walks of life have been preserving these toys. Antique toys are now appreciated by an international audience for their historical, cultural and artistic value. Whether it is the thrill of the hunt, the research of the item, its artistic splendour, precision design, historical significance, or the camaraderie of the toy-collecting world, collecting antique toys is a truly rewarding and fulfilling pursuit. 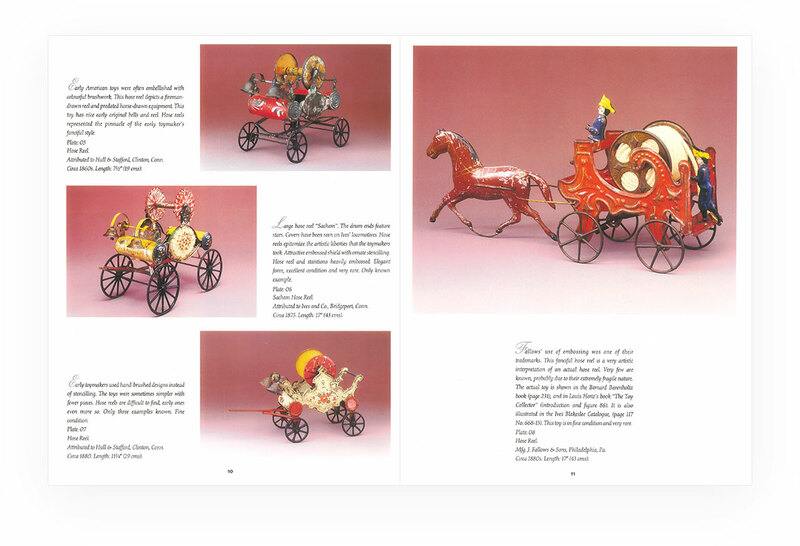 Our book, “The World of Antique Toys, written and published in 1990 by Jeffrey Levy, has been referred to as the ‘bible’ of toy collecting, and can now be downloaded free of charge in PDF format. It remains to this day, one of the most important informative books on the subject. Alternatively, this luxury, leather-bound Limited Edition book containing 268 richly illustrated pages, can be purchased directly from ourselves for 225.00 Euros including free worldwide shipping. To order, please press here. 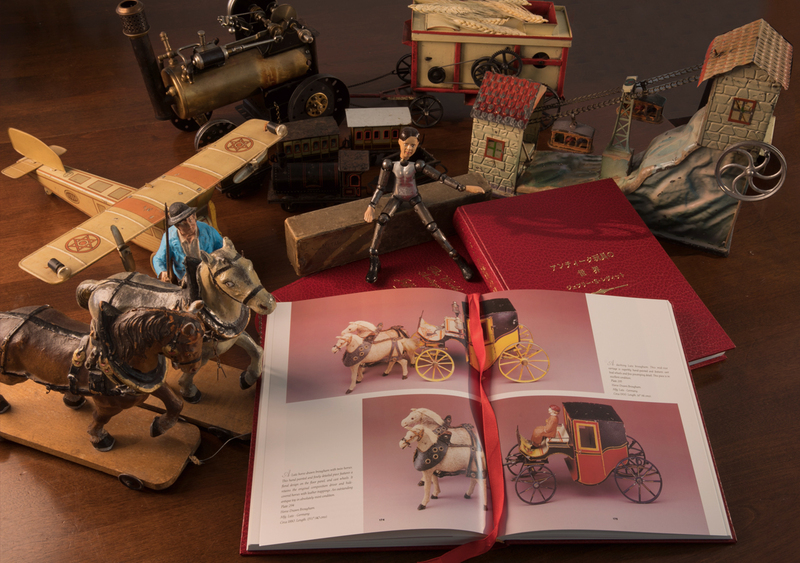 This book was written as a guide to, and a celebration of the artistry and craftsmanship of the world’s greatest toymakers. Artisans were brought together to produce toys that represented much more than the sum of their parts. Many of the toys represented here have never been illustrated before. Born in 1957, the only son of an eminent physicist and engineer, Jeffrey always had a passion for commercially made old toys, and was one of the few people who could see their future artistic and collectable appeal at a time when others couldn’t. As early as the 1960’s, Jeffrey, in his youth, had begun a quest to garner knowledge and understanding of toys from the past, and it was as an adolescent teenager that formed the embryonic stage of his toy collecting passion. In 1980, he opened a collector’s toy shop “Mint & Boxed” in the U.S., and later in London. He soon became the one of leading dealers in early die-cast and tinplate toys, and later in vintage trains. 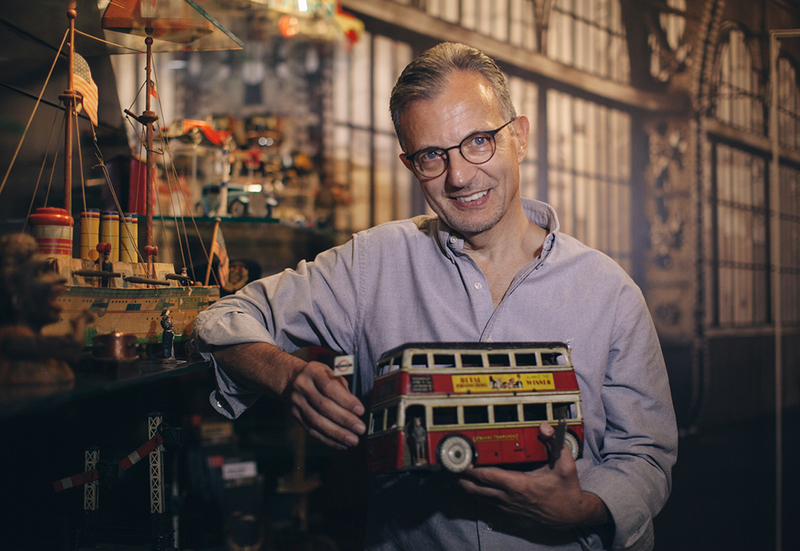 Whilst developing an international clientele, Jeffrey was to foresee the market rise of quality antique toys in the 1980’s which often attracted six figure $ prices, and which today, is the norm. 1989 was to see the opening of his most prestigious antique toy gallery on Madison Avenue, New York – At the same time, he published “The World of Antique Toys”, an accumulation of fifteen years of extensive research on the subject – A mighty tome, which soon became a much sought after title after a one-off limited edition print run of just 5000 copies, including several foreign language editions. After moving to Spain in 1998, Jeffrey opened a Spanish-themed antique toy gallery, “Galeria Navarro”, maintaining all his worldwide links accumulated during three decades of trading in the finest antique and collectable toys. This Gallery is still active today online through their educational and informative website: www.galerianavarro.com which is available in 5 languages – English, German, Spanish, Chinese & Hebrew, all of which reflects the truly international nature and appeal of the business. Today, “The Antique Toy Gallery” in the heart of Tel Aviv, Israel has further ensconced Jeffrey’s position in the world of antique toys – A new website for the Tel Aviv Gallery is currently under construction. Copyright © 2019 TheWorldofAntiqueToys.com. All rights reserved.